Shawn Micallef is Toronto's most famous flaneur. After years spent recounting his walks and explorations throughout our city in the pages of Spacing and Eye Weekly, Micallef last week - with the help of Coach House Books - released his first book. 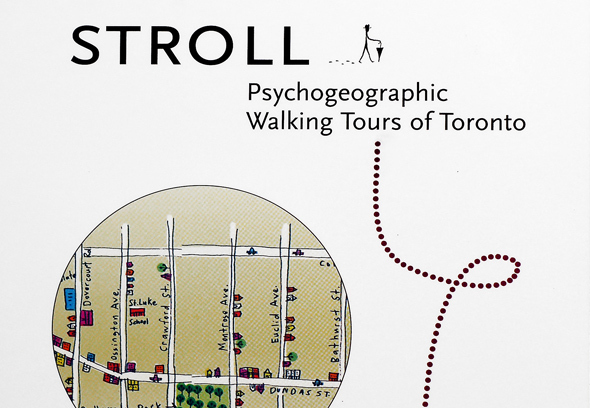 Titled Stroll: Psychogeographic Walking Tours of Toronto, the book is a 300 plus page guide to Toronto unlike any book published to date. It includes thirty-two walks, a flaneur manifesto and dozens of hand drawn maps. In recent days, I connected with Micallef to find out more about Stroll, the challenges of publishing a book and some of his favourite places in Toronto. Stroll is co-published by EYE Weekly. Aside from them publishing your weekly column, in what way did they get behind your first book as a co-publisher? EYE Weekly lent out their Senior Editor, Edward Keenan, to Stroll book editing duties, so that was of critical value...also various in-kind contributions helped with the launch and promotion that, given the economics of Canadian book publishing (don't do it, kids! ), was of great help. The publishing of the weekly column shouldn't be underestimated though as it subsidized my research -- hours spent in archives here and there, wandering and re-wandering neighbourhoods -- lots of information that didn't end up in columns but is in the book. Stroll would have been economically impossible without the columns. How much of the book contains previously published work and how much is new material never before published? It's hard to say; it's all mixed in, but when I started putting together the book I had about 45,000 words of material, and the book is now at 100,000 words. So a little over half is brand new, I'd estimate. The new material was weaved in-between and all around what I had previously written. When I wrote the columns I always had lots of archival bits and description and other streets I had to leave out for space reasons. How did Coach House Books become involved as a publisher? I have essays in four of their uTOpia anthology series and another in their Concrete Toronto book, so I've been "hanging around" the Coach House for five years. I can't remember how the idea came about, I certainly fantasized about doing a Toronto book for a long time, and probably proposed it out loud at one of their nice but tipsy parties. We started officially talking about it around 2008 I'd guess. I didn't think of pitching to other publishers -- I've got a good relationship with them but, also, Coach House has a long tradition of being involved in Toronto things, so them publishing Stroll seems exactly right. How many copies of the book have been printed? The first run is 2000 books. Coach House is one of only 3 publishers in Canada that print their own books (most of this is overseas now), and the bindery can only hold a maximum of 2000 books! How challenging is it to get a book published of this nature? What are some of the challenges and what volume of sales do you need to hit in order to break even? That's the great thing about Coach House, they love to do niche. However they sometimes joke that there is no "in the black" in the small Canadian Press industry. So if not for the assistance of various writing and publishing grants, Stroll would not have been possible. I'm not sure what the break-even point is -- maybe there isn't one. Maybe we need to sell the Stroll movie rights to Jerry Bruckheimer. Where does Stroll go from here? Do you expect to continue to write about psychogeographic walking tours in Toronto? When I look at the fold-out map Marlena Zuber did at the back of Stroll, I feel guilty about the vast areas of Toronto that aren't included in this volume (even at its 300 pages). Toronto's ridiculously big, there's no risk in exhausting the subject, and I still like and want to write about it. Toronto is at the adolescent stage in its growth, so it's a really exciting time to live here right now. What would you like your next book to be about? I'm thinking of a few things. I'd like to start expanding to some Canada-wide themes. There's something about the Canadian way of doing urbanism that seems to work. None of our cities experienced the large-scale hollowing-out that so many American cities did, and I wonder if this is some kind concrete manifestation of the way we view our culture and society. I think the world has a lot to learn from Canadian cities -- not just Toronto, but Vancouver to Hamilton to Halifax and in between. I also have long wanted to write something about my hometown, Windsor, Ontario. It's an exceptionally interesting place, being a border town and largely working class. It's so flat and, in the summer, steams like a jungle. It's given and continues to give me perspective on the world I might not have had I grown up elsewhere. It deserves a book. What's the best thing about living in Cabbagetown? What are some of your favourite spots in the neighbourhood? Best part of Cabbagetown is, apart from the over-the-top preserved Victorian landscape, is being on the edge of the Don Valley. Sometimes I'll go for runs and there will be a deer standing on the path just a few minutes in. Parliament Street is also one of my favorite retail strips in the city too -- it's such a mix of stuff. If it wasn't for the big Regent Park and St. James Town populations on either side of Cabbagetown, the strip would probably be insufferably fancy-pants (which I like just fine, but not exclusively). It seems to serve some very diverse populations effortlessly. Truly Torontonian. My favorite spots are the St. James Town deli, who have the best and cheapest sandwiches for lunch. MP Bob Rae and MPP Glenn Murray share an office next door and are often there for lunch, so it's can have some lo-fi political glamour now and then. Also the Ben Wicks is my favorite bar in the city, and the first place I've ever referred to as "my local." It's got good people running it, good people hanging around, the snobs stay away, and there's WiFi. A big chunk of Stroll was written sitting at the Ben Wicks bar. Where in Toronto do you like to take friends when visiting from out of town? I have a kind of stump tour that often includes walking them into the Toronto Reference Library and going up the five-storey glass elevator. It's Toronto at Zenith, seeing all those people and books. Also the TD Centre is usually a stop, as is Nathan Phillips Square. We'll also go down Graffiti Alley along the south side of Queen, west from Spadina. Farther out, Cliff Lumsdon Park at the end of Islington (by then, 7th Ave) in New Toronto in Etobicoke is a great place to stop. It's got a perfect view of Toronto from an oblique angle, and you can follow the spine of skyscrapers from Queens Quay up to Eglinton. I'll go to Little Malta too, on Dundas in the Junction, where my people still represent. Oh, and secretly, a drive through Toronto's downtown cluster on the Gardiner at night as it sparkles all around is magic, as is coming back into the city on the DVP, where you round the curve after the Leaside bridge and there's our Emerald City rising up in front. What are some of your favourite restaurants in the city? I don't really have any -- I'm not into food and never think about it. Food is utility, thinking too much about it is like thinking about breathing. I do like good food though, an appreciate it when other people take me around to nice restaurants or dinner parties, but otherwise, thinking about restaurants makes me impatient, so I'm happy to be led about. Had a nice time at Seven Numbers once up on Eglinton and Grano on Yonge Street north of Davisville is the place in Toronto that reminds me the most of Malta (apart from Little Malta) in that Mediterranean dining experience kind of way. You're a dapper dresser. Where in the city do you like to buy your clothes? I'm pretty conservative and don't really go for fashion but rather like lots of basic things that can be mixed around into what I feel is right. Kind of like Lego: the basic blocks afforded the most creativity. I have bits and pieces from higher-end places like Holts (or Holt Renfew Last Call, when on a 905 exploration) and on Queen Street Sydney's is about as good a men's store as any city could ask for (one day I'll get him to make one of his bespoke suits for me). Otherwise, I find most of what I want at the mall and is relatively inexpensive. Fashion is kind of lazy, you buy what's hot that moment. Much more fun to build things slowly, and pieces can come from anywhere. Shoes though, never go cheap on the shoes. They're the foundation. What areas/neighbourhoods in the city are you not a fan of? "Not a fan" might be a bit too harsh, but I admit I feel quite a bit of fatigue around Queen West and Ossington, and grumble when I have to go there because that's where some event is being or somebody chose to meet up. Toronto has 2.5 million people and is bloody huge, there are other bars and restaurants to talk about! Though by day, the kilometers-long stretch of galleries here is nearly unmatched by any city in the world. So, I try to grumble quietly. If you had to suggest one stroll for our readers to take next weekend which one would it be? Yonge Street, for sure. All Torontonians (well, everybody in general) should walk its length at least once (either all at once -- to say you did -- or in parts). It passes through nearly every kind of topography and building typology Toronto has, so it "represents" Toronto in many ways.